Having kids never came easy to Stacey Yarborough and her husband. Yet, with the help of modern technology and a big dose of divine intervention they were able to have three beautiful children. On their summer of 08 vacation they brought home more than great pictures. This unexpected souvenir ended up being their fourth child, affectionately known as shrimp. No technology needed–all it took was some of that fresh ocean air and some good EB water! Their sweet baby girl, Lucy is about to celebrate her first birthday, but has already been to EB several times and will go back again frequently in the coming months. 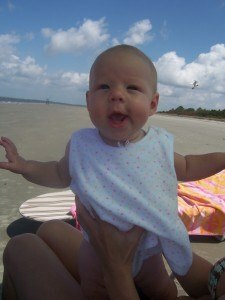 She is truly one of the greatest Edisto memories!